I was thrilled to see that the donna hay website has been completely revamped and looks fantastic! The cool, crisp design is reflective of the donna hay style which has been a pioneering force in the modern Australian lifestyle (simple, beautiful food enjoyed by friends in a relaxed but gorgeous environment). I'm also really excited about the functionality of the new site. There is a huge recipe database with over 400 recipes (along with the gorgeous donna hay signature style photography). You can now search for recipes by ingredient, season or occasion. There are also styling tips, seasonal menus, magazine updates, and an online shop where you can get all the latest donna hay books and merchandise. Check out the new site for your dinner planning tonight, and while you are there, sign up for the donna hay newsletter which promises kitchen tips, updates, special offers and exclusive recipes. P.S. Fill in the survey about the new site and you could be in the running to win a $600 Jo Malone prize pack. 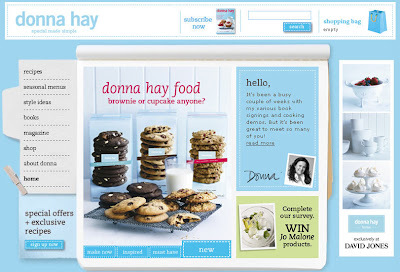 I heart Donna Hay and her website is amazingly easy to use! I wish she sold her homewares range from David Jones on the website. A little birdie told me that it's in the works! Fantastic! I lust over her colander with the claw feet, never in stock at David Jones when I happen to be in town.